I'm a Hoosier that woke up one day in Austin, TX, where I am currently halfway through grad school. When I'm not constructing costumes I'm trying to spend time with my man, our cats, and my knitting! Ich kann ein bisschen Deutsch sprechen (I can speak a little German). 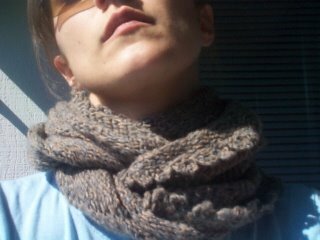 Thus the name for my blog which translates as, "favorite yarn." In late May about two and a half years ago there was a stray black cat hanging about the theatre I was working at at the time. One of the carpenters figured out she was expecting, and later discovered her and her four kittens in the props storage room! He couldn't take them, but he put them all in a cardboard box with a blanket outside the scene shop. The next day, she had moved her babies out of the box to a spot right outside the back door of the costume shop. When I walked out that day and saw her, her kittens tucked under her body, I caved. They were so exposed, I couldn't possibly leave them there, and I couldn't take them to the pound for fear they would all be euthanized. I gathered them up and took them home. A volunteer at the theatre loaned us a large animal cage. I cleaned out my sewing room and settled the kittens into a blanket in the bottom of the cage, and then put their momma in with them. She stretched out as they climbed on top of her to feed, and she looked extremely relaxed and satisfied! I think she knew that now they were safe from the elements and from predators. They had a chance. We decided to call Momma, well, Momma. We nicknamed the kittens, thinking that this tactic would make us impervious to the desire to keep them all. We already had two cats. Abraham is about seven years old now, and Lilly (we always just call her Kitty) is about 4 years old. We didn't necessarily need another one, but for the briefest of moments we entertained keeping two of the kittens. That delusion disspelled as they got bigger and more active. Banshee was all grey, the only girl, and earned her nicknamed for obvious reasons. 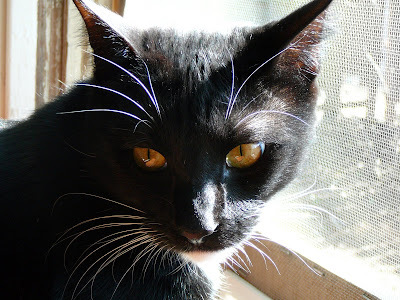 Tough Guy was a tuxedo cat, and the most outgoing and fearless - he did everything first. Got out of the open cage door on his own, climbed us, etc. Scrappy was all black like his Momma and the runt of the liter. 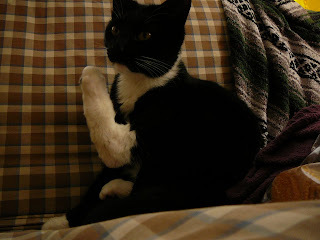 Last, but never ever least in my heart, was another tuxedo cat. He looked at me one day, his little head bobbling on top of his tiny body and told me his name was Sweetface. And he was. As the kittens grew to the age of weening, we starting looking for homes for them. Momma was spayed and went to a loving owner. Banshee was the first kitten to go, and Scrappy was spoken for next. That Guy was drawn to Tough Guy more, but saw how attached I was to my Sweetface, so he conceded to me. Sweetface was renamed Remus. That is how this handsome baby boy came into my life. This past Sunday afternoon, we had to say goodbye to him very suddenly and unexpectedly. I have never had to make this kind of a decision before and was shaken to suddenly find myself in that situation that all pet owners dread. Is it better to treat a sick animal that might not make it? Was it right to make him suffer, perhaps needlessly, simply because you don't want to let them go? This was the decision that we were faced with. 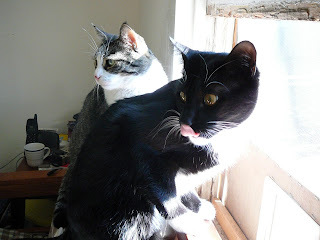 None of the cats have ever been sick, and I didn't realize that when they do get sick, they don't really do anything to let you know until they are very sick. Remus had been sick for at the very least several days, and his infection may have begun even before that, but with three cats, the water bowl is always being emptied and the liter box always has urine in it. We just didn't notice that the water wasn't perhaps being drank as quickly, or that there weren't as many urine clumps as usual. We were getting ready to go for a hike when we discovered him lying in the bathtub, and immediately knew that something was wrong. He was listless when I picked him up, and he lay in my arms for the next 20 minutes while we made a few phone calls and got ready to take him to the emergency vet clinic. I feel sad for him now that he was distressed on the way there - the only time he meowed during the entire experience. This was troubling to me since he has always been such a talker. Despite his behavior though, at this point we both thought that he would be okay. Maybe he was dehydrated from being constipated or had a slight kidney infection. Either way, we would get to the vet, they would check him out, tell us what needed to happen, and we would say okay and take a deep breath before we looked at the bill. What we didn't know was that our lives were going to change when we got into that exam room. We were at the clinic for about 4 hours. They were really fantastic. They gave us all the time we could have wished for to make the awful decision to say goodbye to him. He had a blocked bladder, which is common in male cats and can be a reoccuring disease called FUS - feline urinary syndrome. The way I understand it, when some male cats get a bladder infection, their body can't fight it off. As the infection worsens, blockage forms that prevents them from being able to urinate. Eventually, they stop drinking water as well and become dehydrated, and they get very sick, very fast. It goes without saying that this is very painful. It is this thought that pains me the most - that my baby boy was suffering and I didn't know. How could I not know? I know that unlike us they can't tell you "I'm sick, I'm in pain, and I need help," but as I grieve for this loss I can't help but wonder "what if?" and feel badly. The only treatment option for him at that point was surgery. If you are a pet owner and have ever been in this situation, you know what I am about to say. The estimate was shocking. We knew it would be a lot, but we had no idea it would be as high as it was. Without going in to details, it would have wiped out our savings and we would have needed to apply for the credit plan. That Guy asked the tough questions. Could he get sick from this again? Yes, it was likely that with any future bladder infections this would reoccur. With the surgery, would he have a full recovery? Possibly. Possibly? When their little bodies are so sick, treatment is no guarantee, especially in this case. They would need to keep him no less then three days, possibly more. *That Guy just called me to tell me he talked with his brother. He had the exact same thing happen with a young male cat of his. He had said yes to the surgery. His cat didn't recover and the vet wanted to do another surgery - one that essentially turns the cat into a girl. At this point, he said no. The cat had suffered enough. The vet refused to euthanize his cat, and the poor animal died a horrible, painful death. I can't say that this makes me feel better about losing Remus. On the contrary, I feel terribly for Todd and his cat! But it does help me feel better about our decision. He said that letting him go was the most humane thing we could have done for him to prevent him from a future of unnecessary suffering. And I can't help but wonder, if when we found him, if he was at the point that he knew he was dying, would he understand if we put him through surgery and he suffered needlessly? It would have been selfish of us. I would like to think that he was aware, in those last painful hours, that we were with him, that we helped to make him more comfortable, and eased his suffering. I am sorry that we had to take him out of his home only to find that he couldn't come back with us alive and well. I can say that the vet staff was fantastic though. Even as we were struggling with the decision, they reassured us that they were doing what they could to make him comfortable. They put in a catheter to try and release some of the blockage and urine to relieve some pressure on his bladder (some blockage did come out, but the surgery would ensure all of it was removed, relieve the bladder of infected urine, and they would flush it out to try and eradicate the infection that started it all). They had him on an IV to rehydrate him, and they had given him a pain killer. They told us so many times to take as much time as we needed. They went over every option and they were honest about his chances of survival. They even reworked an estimate in the event that we wanted to keep him there overnight and transfer him to a day clinic (less expensive) for the surgery, but then again, he might not make it through the night. I really didn't want to let him go, and I seriously considered going through with the surgery. I didn't want it to be about the money. But deep down, I knew that it wasn't. I knew it would be selfish to ask him to suffer just so I might be able to hold on to the hope that he would be okay. I looked at That Guy and asked him, if it were only him making the decision, would he arrive at the same choice I was arriving at? He said he would, absolutely. I asked him, if I wanted to do the surgery, would he go along with me? He said again, he would, absolutely. The fact that he would support my decision, regardless of the cost, regardless of the distinct possibility that Remus might not survive, might not recover, might get sick again, might suffer needlessly, made it clear to me. If That Guy was unselfish enough to go through with the surgery, then I needed to be unselfish enough to do what was right and humane, and say goodbye to my baby boy. My only other moment of weakness occurred when they brought him back into us. He was still listless in my arms, he did not meow, but he did slowly wave his long tail back and forth. He was at least comfortable from the pain killers. I asked That Guy to get one of the Vet Techs. I told her that I needed to her from her that he couldn't get better on his own, and that relieving him of his pain was the right and humane thing to do. She assured me it was. He couldn't go home at this point. His kidneys would shut down and he would die very painfully. She told us again, spend as much time with him as you need to with him. We had found him in lying in the bathtub a little before 2pm. Sometime after 5pm, I held him in my arms and together we told him that we loved him, we were sorry that we didn't know he was getting so sick, that he had been a wonderful cat, and we were eternally grateful for the time that he had shared with us and the love he gave us. We told him we will always remember him. The vet came in and explained what might happen when he was given the injection. He took a few deep breaths, and then he was gone. I closed his eyes for him. We took him home and buried him on the side of the house. We are going to plant a bush there so that we can see him again, a part of the cycle of life on this earth, and so that we might take the bush along with us one day if we leave the house for a new one. In life, Remus was a comfort and a blessing. He had a long body and an even longer tail. To me, he was about as devastatingly handsome as a cat can be. He was a high energy kitten who kept the other two cats on their toes, and a moody teenager prone to what seemed like impossibly long naps! He and Abe would often have sessions in which they groomed each others heads, which then somehow led to them tussling. I think Remus was always in love with Kitty, even though she didn't seem to reciprocate it, but rather merely tolerated his attentions. His long tail curled back and forth in the form of a question mark. He had a way of asking a question with his meow. At night, when we went to the bedroom, he would meow from the front room, "Where are you?" and come running in to jump on the bed after we said, "In here!" He loved to snuggle in between us, bury his head in one of our sides, and knead the blanket with his paws. He loved to claw the sides of That Guys amplifier, and he let him do it. 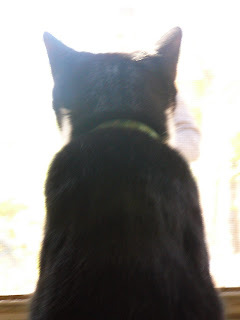 And as you can see here, he loved to gaze out the front screen door and the windows. On the two occasions he got outside, he quickly tired of his adventure and meowed until I found him. I will always be a little heartbroken to have lost this wonderful creature, but I am so happy to have spent the time with him that I did, to have loved him, and to have had his love in return. Rest in peace, Remus. You will live on in our hearts. Mask making is wicked fun!